Bunratty West Holiday Home in Bunratty, County Limerick sleeps 6 people. Situated in Bunratty village, Bunratty West Holiday Home is a terraced holiday cottage is an ideal base for families, friends or couples to relax in and enjoy the surrounding area. Famous for its castle, Bunratty is a perfect location to visit attractions including the Cliffs of Moher, the Burren, Aillwee Caves, dolphin watching and many more. The village hosts craft shops, restaurants and a famous pub. The shop is 50 yards, with the pub and restaurant being 4 miles from Bunratty West Holiday Home. 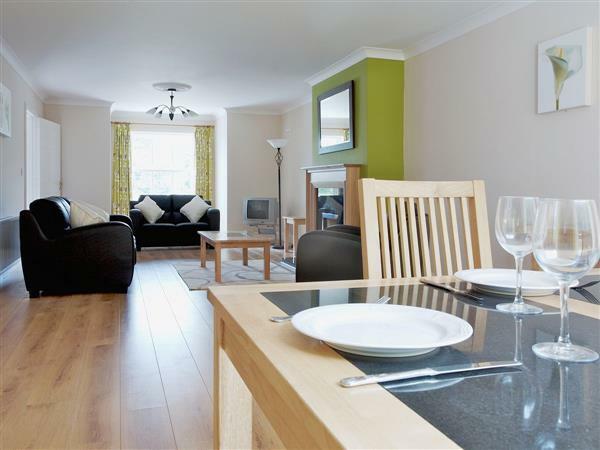 Ground floor: Living/dining room with patio doors and wooden floor/kitchen with tiled floor. Utility room. Separate toilet. First floor: 3 bedrooms: 2 double, one (5ft) with en suite shower room and toilet, 1 twin with access to bathroom with shower over bath and toilet (access also from hall). Gas coal-effect fire in living room included. Gas central heating and electricity by meter reading. Bed linen included. Towel hire. Travel cot and high chair on request. 28 Freeview TV. Electric cooker. Washer/dryer. Dishwasher. Fridge/freezer. Wi-Fi available at €15per week. Enclosed lawned garden with patio and sitting-out area. Shared grassed area. Parking (2 cars). No smoking at Bunratty West Holiday Home in Bunratty. For a better idea of where Bunratty West Holiday Home is, you can see Bunratty West Holiday Home on the map below. Do you want to holiday near Bunratty West Holiday Home (W32139), you can see other cottages within 25 miles of Bunratty West Holiday Home; have a look to find your perfect holiday location.